Many interesting events took place at our Shrine this year. A lot of people made their pilgrimage to visit the Shrine of the Blessed Vrigin Mary of Czestochowa. We present the most important events of the year 2018. Praise the Lord for everything that has happened! Which one was your favorite event this year? On Sunday, January 14, 2018, our Shrine became a special place of prayer of children and teachers. Teachers of the Central Polish Supplementary Schools (CPSD) in the USA participated on the day of recollection at our Shrine. It was also the day when in a special way we remembered Saint Paul the First Hermit, the patron of the Pauline Order, but also the patron of children. After the Holy Mass, children from the Polish School of Our Lady of Częstochowa, performed a beautiful Christmas Nativity play. On Friday, January 19, a group of over 30 people from our Shrine have participated in the 45th March in for Life in Washington D.C. The retreat took place on February 17-18. Father Dominik Libiszewski OSPPE was in charge of organizing and preaching RYMcerze (Bęsiu and DJ. Yona), rappers from Poland, accompanied him during this retreat, who evangelized the youth through rap and music, and shared the testimony of their lives with young people. At the beginning of 2018 the construction of the new church elevator has begun. The elevator will be attached to the Main Church and the Chapel of Our Lady of Czestochowa. It will also contain “The Heritage Hall” with memorial trees. The hall will be dedicated to all the victims of Communism and there will be bronze sculptures dedicated to the heroes from these days in Poland – Saint John Paul II, Blessed Jerzy Popieluszko and Venerable Cardinal Stefan Wyszynski. The opening of the Elevator building is planned for Spring 2019. The Paschal Triduum, the most important days of the liturgical year in the Church, celebrating the Passion, death and resurrection of Jesus Christ, took place in the American Częstochowa in an extremely beautiful liturgical and musical setting, and with beautiful Christmas decorations. The Divine Mercy Sunday has been celebrated by Fr. Frank Pavone, National Director of Priests for Life. Fr. Frank was the main celebrant and homilits during the Mass. He also led the Divine Mercy devotion and Pro Life conference after the Eucharist. First International Day, was organized at our Shrine. The theme of this day was “One Heart, One Spirit”. Various nationalities that have participated in this celebration: USA, Poland, Italy, Nigeria, Mexico, Scotland, Hungary, El Salvador, Guatemala, Philippines, Peru, Ecuador. They all came to the Shrine for the same reason – to pray together and to present their national traditions. On April 20-22, the Shrine of Our Lady in Doylestown, PA became the capital of Polish Scouts, not only in the US but also in the world. Throughout the weekend in American Częstochowa an instructor conference of the Polish Scouting Association ADASTRA XXIV took place with the theme: “Yesterday, Today, Tomorrow”. This conference gathered many Polish scouts from various parts of the world, including from England, Ireland, Canada, Australia, Poland and many other countries. For 10 years, on every thirteenth day of the month from May to October, the Fatima Day devotions take place at American Częstochowa. This year the celebrations were led by guest priests: Frank Pavone, Father Mariusz Koch CFR, Archbishop Tomasz Wenski, Msgr. Joseph Gentili, and Msgr. Tomasz Grysa. During the Memorial Day Weekend, on Saturday and Sunday, the National Shrine of Our Lady of Czestochowa was hosting a second annual living history faire called “Poland Through the Ages”. Numerous historical reenactment groups, have participated in this year’s festival. They represented different periods of Polish history, from 10th to 20th century. The largest among the groups were 17th Century reenactors, depicting the period of the Swedish Deluge. They presented a symbolic battle of the Siege of Jasna Gora Shrine (Czestochowa). The ceremonies of the Feast of the Holy Body and Blood of Christ (Corpus Christi) took place at 12:30 pm. After the Mass, a traditional procession took place in the Sanctuary, to four prepared altars. The procession was attended by the Pauline Fathers and Brothers from the monastery in Doylestown, representatives of various groups and communities, children from the Polish Saturday School and altar servers as well as many pilgrims. 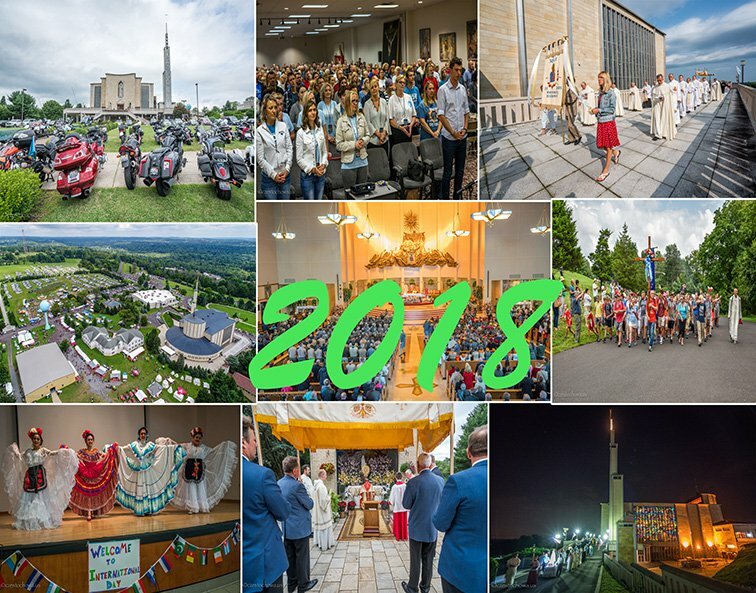 Over 400 people from various US states took part in the Sixth Charismatic Forum in American Czestochowa on June 22-24, 2018. This year’s retreat was hosted by guests from Poland: Marcin Zieliński and Fr. Radosław Rafał. On Sunday, July 1, the 20th Pilgrimage of the Radio Maria to American Czestochowa was held. This years’ theme was “Poland was resurrected with love”. It referred to the 100th anniversary of Poland regaining its independence. On the occasion of the memorial of Saint. Christopher, on Sunday, July 22, the Pauline Fathers in Doylestown blessed all cars and all other vehicles throughout the day. Traditionally, it was also a special day when many pilgrimage groups arrived at our Shriner, both on motorcycles and bicycles. On Sunday, August 12, three pilgrimages arrived at American Częstochowa: 31. Pilgrimage from Great Meadows, NJ, 17th Philadelphia Pilgrimage, 16th Pilgrimage from Trenton. Over 4,000 pilgrims gathered for Mass. Pilgrimage in the Main Church, chaired by Archbishop Thomas Wenski, Archbishop of Miami. On the occasion of the 100th anniversary of regaining independence by Poland and the creation of the Polish Armed Forces in USA, the veterans’ feast in American Częstochowa had an extremely solemn and important character. In the vestibule of the church a plaque commemorating the 100th anniversary of the Polish American Military Action was blessed and hang on the wall. The celebrations took place during the Mass at 12:30 PM. The Eucharist in the Upper Church was presided over by Archbishop Thomas Wenski, Archbishop of Miami. The homily was given by Fr. prof. dr hab. Antoni Dębiński, Rector of the Catholic University of Lublin (KUL). At 3:30 PM, Vespers and the Eucharistic Procession around the Church took place. The prayer was presided over by Fr. can. Mirosław Król, chairman of the Polish Apostolate Committee and also the Chancellor of the Polish Seminary of Saints Cyril and Methodius at Orchard Lake. 53rd Annual Polish-American Festival & Contry Fair took place at the National Shrine of Our Lady of Czestochowa for five days, over the first two weekends of September – 1st, 2nd and 3rd (Labor Day Weekend) as well as on the 8th and 9th (the second weekend) of September. During this time over 22 000 people have visited the Festival at the Shrine grounds. On Sunday, 16 September, Minister of National Defense Mariusz Błaszczak visited American Częstochowa. The Minister came with a private pilgrimage to the Shrine in Doylestown, on the occasion of his visit to the USA. On the Memorial of Our Lady of the Rosary, the traditional Rosary Procession took place at our Shrine. This year’s prayer was part of the “Rosary from coast to coast in the US” initiative. During the celebration, the faithful prayed the Holy Rosary in many different languages, such as: Polish, English, Spanish, French, Italian, Vietnamese, Filipino, German, Latin and various other languages. The Rosary was recited both in the church, in front of the Icon of Our Lady of Częstochowa and the statue of Fatima, as well as during the procession around the rosary garden and around the Shrine. This year’s parade was special because of the hundredth anniversary of Poland regaining its independence. The event was attended by many Polish groups and organizations. Children from the Polish School presented themselves. The procession to the cemetery gathered the faithful who wanted to pray for their deceased family members and friends, on the occasion of the All Souls Day. Every year, the Pauline Fathers and Brothers want to express their gratitude to all the volunteers of American Czestochowa. On this occasion, the annual Volunteer Dinner is organized. The meeting on November 10 was attended by teachers, altar servers, shers, cantors, volunteers of the Polish-American Festival, and all who offered their time and work for this beautiful place. The central moment of the celebration of the 100th anniversary of Poland’s regaining independence was the Mass of thanksgiving celebrated for Poland. It was attended by veterans, representatives of Polish schools in the USA, scouts, historical reconstruction groups, representatives of Polish organizations as well as priests and people of consecrated life. At the end of the Holy Mass, the patriotic and historical part began with the presentation of important moments and people in the history of Poland. The national anthem of Poland and the United States was also sung. The American Częstochowa was the starting place (April 21) and the end (November 17 and 18) of the Leader School for Polish charismatic groups. It was an initiative undertaken by Polish-speaking communities operating on the east coast of the USA. Shrine’s new website has been launched on December 24, 2018. Although it is not perfect, and many things still have to be finished, it offers more possibilites to all our visitors. New look and convenient informations, calendar and online forms can help all those who want to learn more. You can register a pilgrimage group, sent a Retreat House booking request, prayer request and ask for a Mass to be celebrated in a specific intention and much more through the new website. The Solemnity of the Nativity of the Lord is always celebrated at the National Shrine of Our Lady of Czestochowa in a very festive and reverent way. The beauty of this holiday is emphasized especially by the marvelous decorations at the Shrine – colorful Christmas lights, Live Nativity scene with animals, an indoor Neapolitan-style Nativity scene with moving statues and a beautifully decorated church with Christmas trees and flowers. Above all, however, our Shrine is a place of prayer and meeting with God. Two solemn Masses took place in our Church in celebration of Christmas. On December 24th, at 5:00 pm several thousand people have gathered for the Christmas Vigil Mass in English. The Liturgy was celebrated by Father Edward Volz OSPPE, Director of the Shrine. The solemn Mass in Polish took place at midnight. This Mass is traditionally called “Shepherd’s Mass”. The main celebrant of the liturgy was Fr. Tadeusz Lizinczyk OSPPE, Provincial of the Pauline Order in the USA. Christmas Concert took place in St. Anne’s Chapel on Sunday, December 30, 2018. Carols and hymns were sung both in English and Polish.Among those who performed were: Our Lady of Czestochowa Choir, Polish Christmas Quartet, Children of the Polish School, Our Lady Brass Ensemble, Soloists (Hope Lacson – sopran and Bob Strychalski – trumpet) and others. The concert was prepared and supervised by our Shrine Music Director & Organist – Mr. Pawel Raczkowski. See the best photos of 2018 from our Shrine.